Easy no bake Chocolate Peanut Butter Pretzel Bites are the best sweet and salty dessert and my favorite snack. Sweet and salty, creamy and crunchy…these yummy little bites are so addictive! I simply love the taste of recipes like this, another great tasting recipe is the chocolate peanut butter cheesecake. 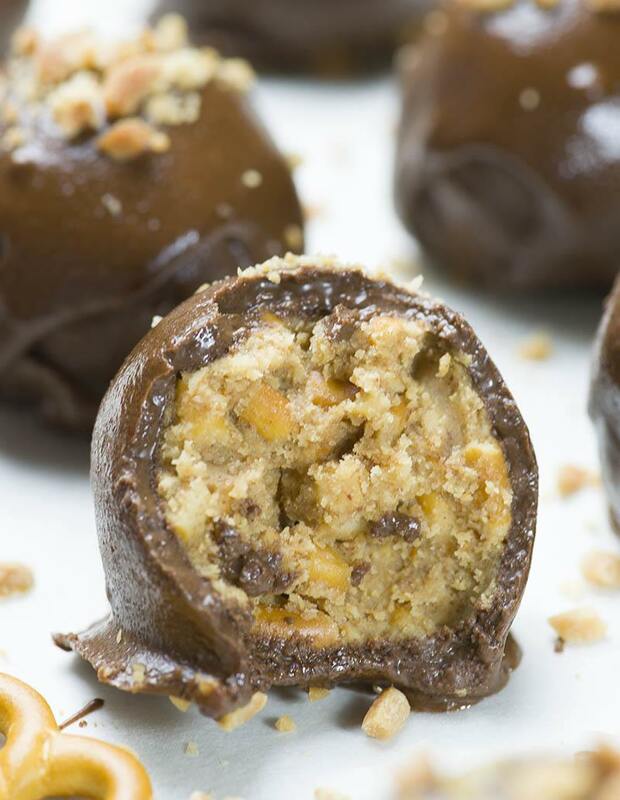 WOW, just imagine crunchy pretzel pieces and smooth peanut butter dipped in chocolate! When I’ve tried the first one, I couldn’t stop myself. I barely save enough for the photos. If you love sweet and salty combo as much as I do, you will be really satisfied with these yummy bites. 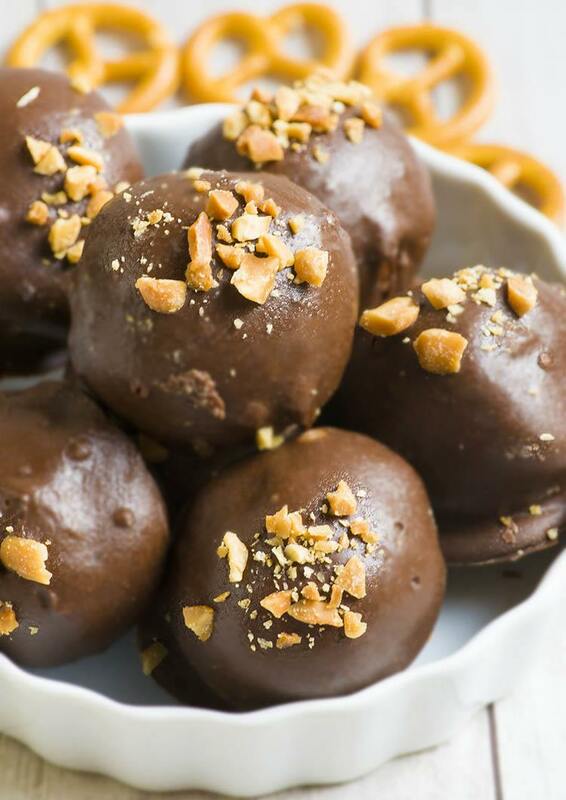 Chocolate Peanut Butter Pretzel Bites are so delicious, but also really simple to make. It’s no bake recipe with just a few simple ingredients. Actually, you don’t need the oven, but you don’t need the mixer, too! Just stir all ingredients together, chill, roll the balls, melt some chocolate and dip them. Wait the chocolate cover to set and ENJOY!!! And you will enjoy for sure! These easy, no bake Chocolate Peanut Butter Pretzel Bites taste like Reese’s, just with addition of crunchy pretzel pieces. They are out of this world! To tell the truth, I’m a huge fan of sweet and salty combo. That’s the reason why these yummy bites swept me of my feet. Actually, I sprinkle crushed salted roasted peanuts on top of each truffle. Crushed peanuts added extra crunchiness and salty flavor to these bites. If you don’t have it on your hand, you can omit this step, it’s totally optional. But you have to make these, that’s not optional. You won’t regret it! I’ll make these yummy Chocolate Peanut Butter Pretzel Bites again (as soon as possible). And these Chocolate Peanut Butter Pretzel Bites will be on my Christmas tray for sure. These will be my new “Christmas cookies”. Easy no bake Chocolate Peanut Butter Pretzel Bites are the best sweet and salty dessert and my favorite snack. Pulse pretzels in a food processor to make small pieces, or place them in a zip-lock bag and crush them with a rolling pin, set aside. In a bowl combine peanut butter, softened butter, brown sugar and vanilla, stir well. Add powdered sugar, stir well. Add crushed pretzels and stir until evenly combined. Cover and place in the fridge for 20-30 minutes. Roll 1 inch balls and arrange them onto tray lined with baking paper. If the dough falling apart when you roll it between your palms, take 1 heaping Tbsp. of the dough, first squeeze it gently with your fingers, then roll to make nice round shape. Freeze until firm. Melt the chocolate and dip each ball into melted chocolate, then place back on a trey lined with baking paper. Sprinkle with crushed peanuts and place in the fridge until the chocolate has set. Store in an airtight container in the fridge up to 1 week or freeze for longer storage. This recipe makes about 26-28 truffles.